The fast-paced and thrilling sequel to Don Winslow's epic drug novel, The Power Of The Dog. It's 2004. DEA agent Art Keller has been fighting the war on drugs for thirty years in a blood feud against Adan Barrera, the head of El Federación, the world's most powerful cartel, and the man who brutally murdered Keller's partner. Finally putting Barrera away costs Keller dearly ? the woman he loves, the beliefs he cherishes, the life he wants to lead. Then Barrera gets out, determined to rebuild the empire that Keller shattered. Unwilling to live in a world with Barrera in it, Keller goes on a ten-year odyssey to take him down. His obsession with justice ? or is it revenge ? becomes a ruthless struggle that stretches from the cities, mountains and deserts of Mexico, to Washington's corridors of power, to the streets of Berlin and Barcelona. Keller fights his personal battle against the devastated backdrop of Mexico's drug war, a conflict of unprecedented scale and viciousness, as cartels vie for power and he comes to the final reckoning with Barrera ? and himself - that he always knew must happen. The Cartel is true-to-life story of power, corruption, revenge, honour and sacrifice, as one man tries to face down the devil without losing his soul. It is the story of the war on drugs and the men ? and women ? who wage it. 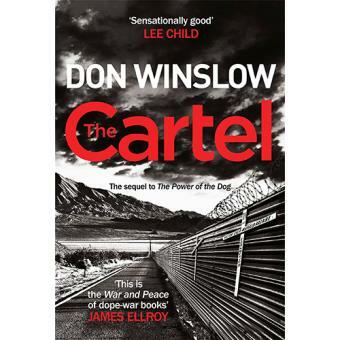 From the bestselling author of the acclaimed The Power of the Dog comes The Cartel, a gripping true-to-life epic, ripped from the headlines, spanning the past decade of the Mexican–American drug wars. It’s 2004. DEA agent Art Keller has been fighting the war on drugs for thirty years in a blood feud against Adan Barrera, the head of El Federación, the world’s most powerful cartel, and the man who brutally murdered Keller’s partner. Putting Barrera away costs Keller dearly – the woman he loves, the beliefs he cherishes, the life he wants to lead. Then Barrera gets out, determined to rebuild the empire that Keller shattered. Unwilling to live in a world with Barrera in it, Keller goes on a ten-year odyssey to take him down. The Cartel is a true-to-life story of power, corruption, revenge, honour and sacrifice, as one man tries to face down the devil without losing his soul.